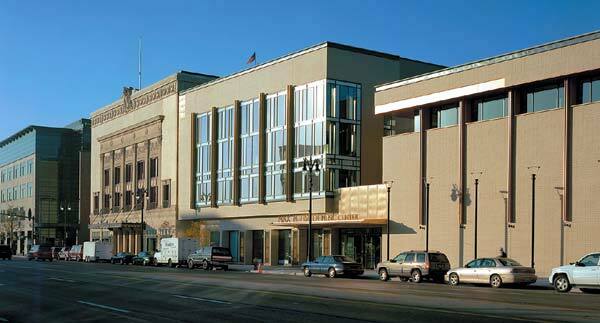 The restoration and expansion of historic Detroit Symphony Orchestra Hall sparks downtown redevelopment. 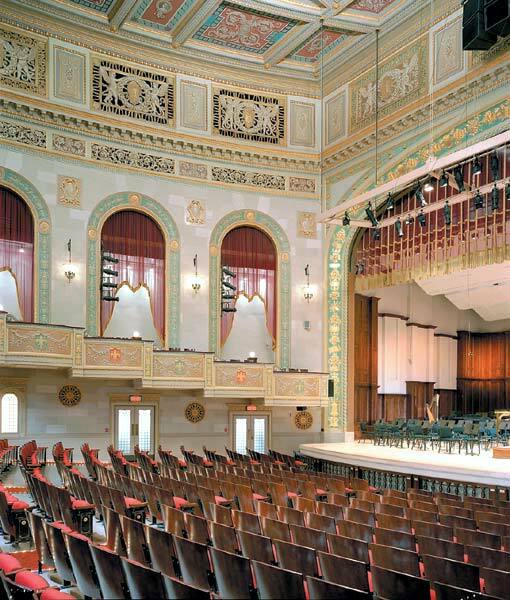 Coveted by musical greats of time past, and resurrected numerous times, the historic Detroit Symphony Orchestra Hall (DSO), a 2,000-seat theater designed by C. Howard Crane and built in 1919, has been witness to both musical and social evolution. 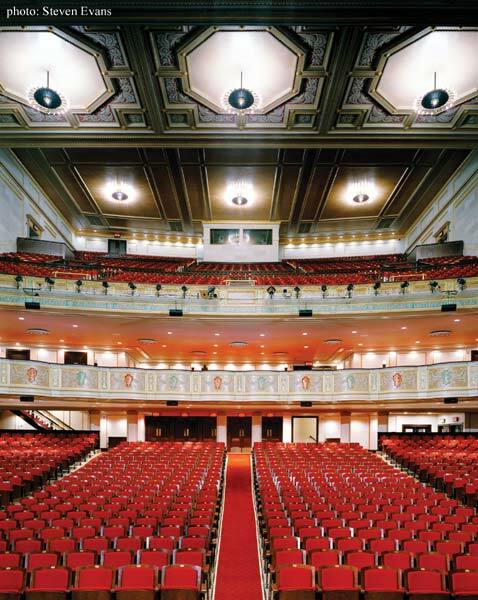 Considered one of a half-dozen best halls in the U.S. in terms of both elegance and acoustics during its heyday, the building served as the home for the Detroit Symphony Orchestra until the early 1930’s, when it was reincarnated as a movie house and jazz club named The Paradise Theatre. 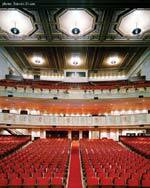 As a symphony hall with the heart of a jazz club, the theater played host to many significant figures from opera to the jazz scene, including Enrique Caruso, Ella Fitzgerald, Louis Armstrong, Charlie Parker, Duke Ellington, and Lena Horne, to name a few. Its resurgence, however, was short lived as its doors were closed in the early 1950’s. The building sat derelict until the late 1970’s when a group of musicians, passionate about the hall and its artistic history, mounted a campaign against its eventual demolition and succeeded in buying it back. After a very basic restoration and nearly two decades of abandonment, the hall hosted to a series of musical groups again in 1989. 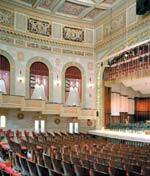 As a part of the three-phase, $220 million Orchestra Place Development Project, a campaign was organized by the City of Detroit to significantly renovate and expand the DSO Hall in 1999. A number of prominent architects were invited to submit proposals, and Toronto-based Diamond and Schmitt Architects (DSA) was selected to lead the project. 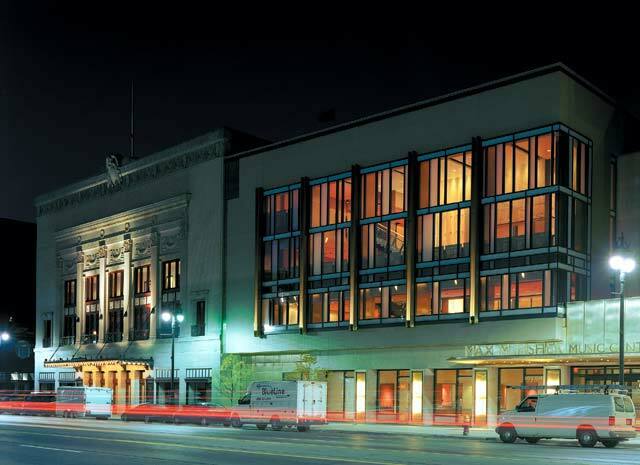 The $60 million dollar revitalization of the historic Orchestra Hall and addition of the Max M. Fisher Music Center (known as “The Max”) is a catalyst for re-imagining and revitalizing the once thriving downtown core. Fairly modest in its composition, the original DSO Hall not only had a rather insignificant lobby, it lacked appropriate ventilation (resulting in less than perfect acoustical isolation), and the support spaces that are now customary in all modern theaters. 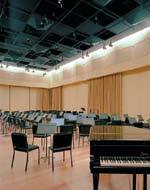 The DSA team, led by co-principal Donald Schmitt, completely restored the existing 50,000-square-foot Orchestra Hall while upgrading mechanical, electrical, and acoustical systems. The new 135,000-square-foot Max Center is heralded from the street by a four-story atrium housing a 17,000-square-foot lobby that connects multiple levels of the existing hall to the addition. The addition includes the Music Box – a 450-seat, highly flexible multi-purpose hall, rehearsal and dressing rooms, temperature-controlled environments for instrument storage, administration spaces, a music school, and music library for DSO’s vast collection of rare and historic scores. 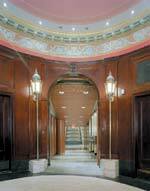 The interior of the historic Orchestra Hall is distinguished by a heavily decorated style of plaster formwork used for both the ceiling and wall details. 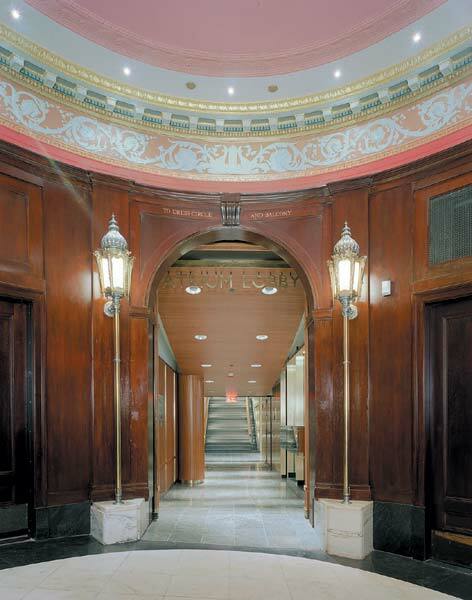 To preserve the original plasterwork, and to avoid unsightly hanging ductwork that would diminish the ornate character of the space, a new plenum was cut in the basement (along with a newly poured floor that matches the original) making room for a mechanical system underneath the seating area. 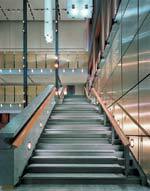 This system allows low velocity air of varying temperature into the theater space without disruption to the historic fabric of the hall. 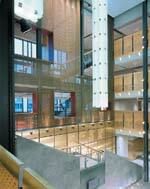 The wash of opulent material over exposed structural members softens the otherwise industrial nature of steel, and creates a sense of “grand occasion.” The atrium features a series of bronze chain mail curtains that are a marked contrast to the solid exposed steel beams and stair guards of punched bronze panels. Slender glass-clad “light boxes” suspended from the atrium ceiling are a crisp, contemporary take on what would classically be chandeliers. 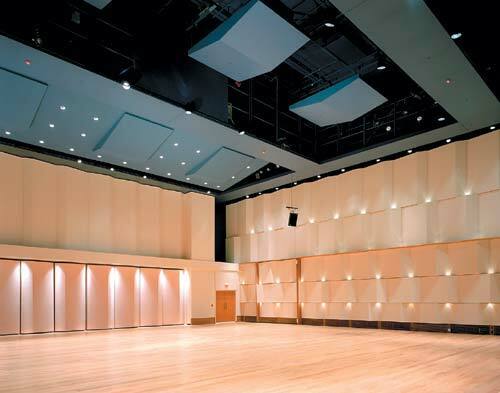 The new Music Box performance hall is an intimate space for multiple programming opportunities ranging from chamber music to jazz recitals – to a banquet hall. Cleverly designed seating can be retracted into a wall, and retractable doors create a variety of connections to surrounding spaces. 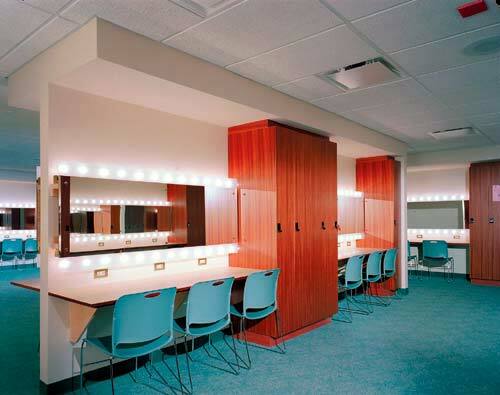 In addition, hinged front walls can be configured to acoustically “shape” the space for different events. 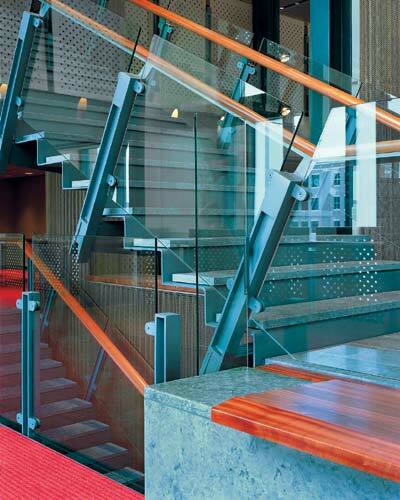 Diamond and Schmitt Architects has not only united the restored Orchestra Hall with the new facilities – without compromising the spatial integrity of either – but has transcended the formal world of music by effectively engaging the surrounding community. Architectural form that creates a sense of accessibility and connection to its urban environment strikes just the right chord for downtown Detroit. The Max. 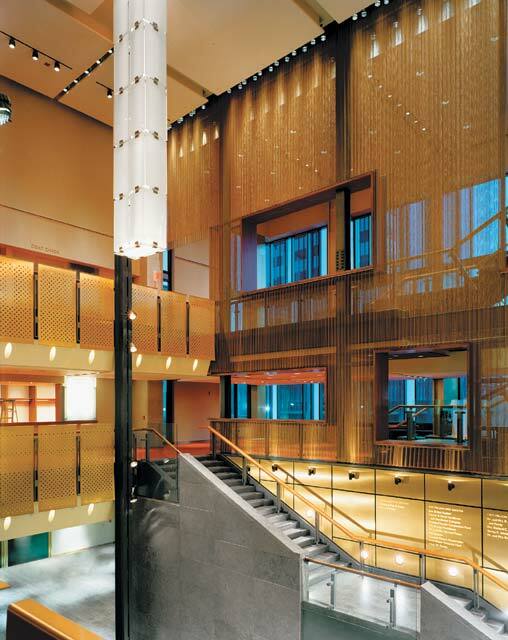 M. Fisher Music Center opened on October 11, 2003 with two weeks of events that also showcased the fully restored Orchestra Hall. 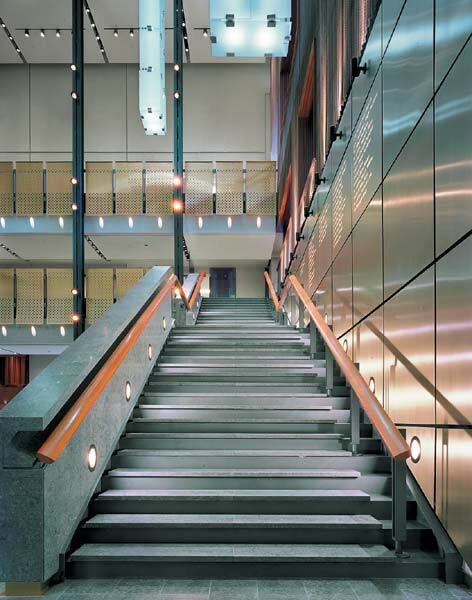 Established in 1975, Diamond and Schmitt Architects services include architecture, urban planning, landscape architecture, building conservation, and interior design. The firm, with a staff of 112, has received international recognition with more than 90 design awards, including six Governor General’s awards for architecture. DSA has undertaken projects in Canada, Cuba, Czech Republic, England, France, Israel, Malaysia, the People’s Republic of China, the United States, and the West Indies. 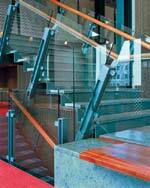 In 2003, the firm received the Award of Excellence – Architectural Firm from the Royal Architectural Institute of Canada. 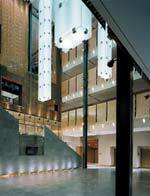 Urban Aria: Four Seasons Centre for the Performing Arts, Toronto, by Diamond and Schmitt Architects: The art and science of architecture fuse to create poetry of form.